Home / Columnists/ Can humans and animals coexist in increasingly limited spaces? Can humans and animals coexist in increasingly limited spaces? Many wildlife species are close to extinction, or at least threatened, because of human impact. The usual strategies of co-existence are to confine more and more the habitat of wildlife to smaller reserves, parks or other fenced areas, to protect the remaining wildlife in that location, and the settled humans as well. Where centuries ago, wild animals posed a real threat to humanity, nowadays it is the other way around. It is us humans who are on the way to eradicate a large number of animal species from this planet. It is our perception of human right to dominate all other creatures. Some people derive that right from religion – which seems even more distorted, given that if one believes in a godlike entity creating this planet, how could one at the same time believe that one species would have the right to destroy this creation? Leaving beliefs and assumptions aside, I would like to share and highlight two approaches for human-animal coexistence which have been explored internationally. The world is becoming more and more crowded; fencing out of either humans or animals might not be the best way for the future. A study by Carter and colleagues (2012) has researched coexistence of humans and tigers in Nepal, and found that they actually shared the same geographic area, and have adapted to each other’s living habits in a way that they did not disturb each other. Two crucial factors which were mentioned are 1) the wild species needs to have sustainable amounts of food in the location and 2) poaching has to be strictly controlled. 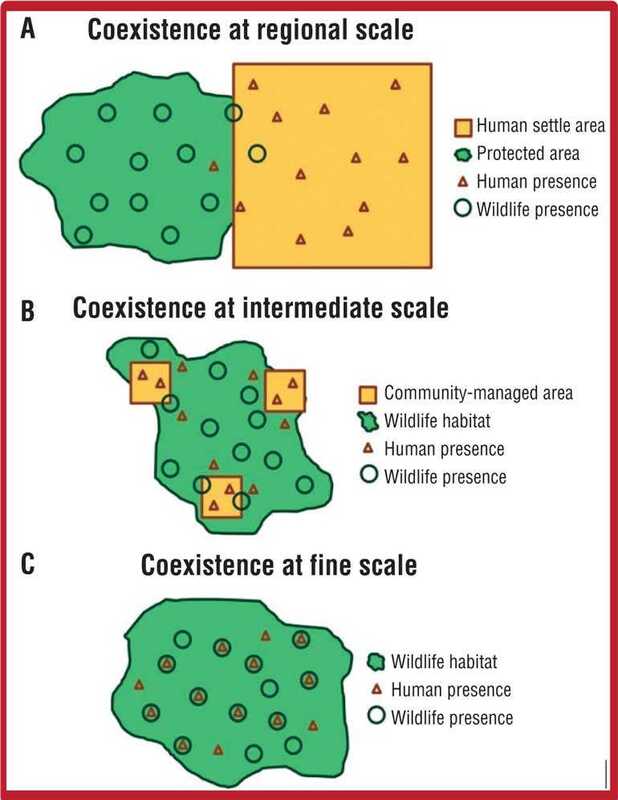 This example, including humans and tigers, shows that even in assumed dangerous situations, for both species, coexistence is possible. In the majority of cases, the wildlife which is considered in danger includes far less dangerous animals, such as deer, crabs, and frogs. In the case of Sri Lanka, it includes elephants, crocodiles, bears and leopards. Where it will not be possible to establish safe coexisting zones where wildlife is decreasing, there are other solutions which can help reduce the loss of wildlife. Those who love nature would probably want a Sri Lanka full of wildlife and rich in plants and jungle. Perhaps certain sacrifices have to be made when a country is developing – however, it all depends on how this is done. One can create an environment where humans and animals live side-by-side, or one can destroy animal habitat and then complain that wild animals are in conflict with human living spaces. If a road runs right through a place with frequent animal traffic, then accidents and conflict can be foreseen easily. A few days ago, the news reported an accident where three elephants were killed by a train in the vicinity of Batticaloa. The reports are short and focus more on the train repairs than the elephants killed. One report in the Daily Mirror mentions the following: “Three elephants were killed on the spot after being hit by a train travelling along the Batticaloa–Colombo route near Welikanda on Saturday night, police said. The train had hit the herd of elephants that were reportedly crossing the railway line in pitch darkness. This comes weeks after two calves and their pregnant mother were fatally struck in the same area.” This suggests that elephants’ movements are somewhat known and frequent in this area. Each country faces the challenge of balancing development with sustaining natural habitats. Some nations, however, have succeeded in creating corridors for animals to cross roads and tracks without harm. Let us not forget that animal-vehicle collations lead to loss of human life as well, and the financial cost of repairs due to these accidents. Canada, for example has established a system of animal crossings and fencing along the Trans-Canada Highway which has proven almost 100% successful at preventing animals being hit by vehicles. 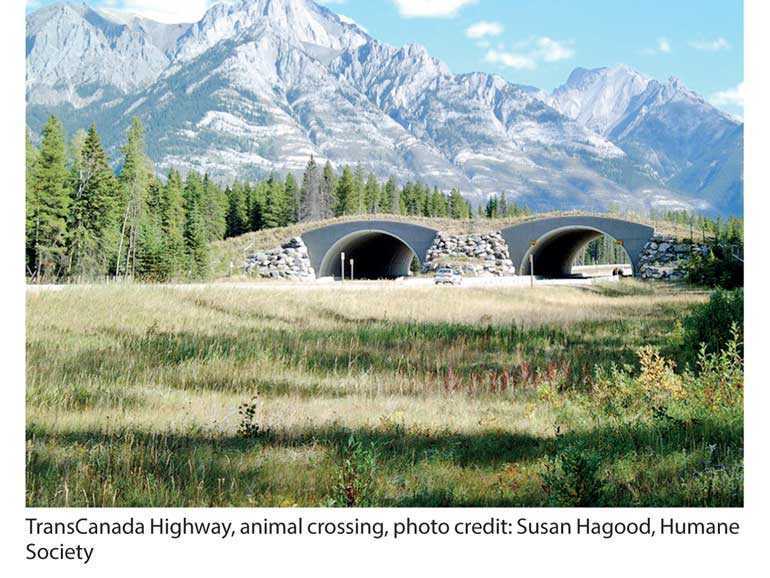 It is reported that the Rocky Mountain west section in Montana includes more than 70 wildlife underpasses, and Netherlands has built more than 600 culverts to enable their wild animals to cross roads and tracks. Therefore animal crossings can be either via bridges, underpasses, or culverts. Many times, these constructions are not even noticed by car drivers. Often the corridors are fenced to lead animals into the right direction to use the crossing. There is the question of effectiveness of these crossings and underpasses. Where they are fairly simple to implement, there is also plenty of evidence that they are a win-win and simply work. Research studies have been conducted by the University of Montana, the University of California, Washington University and others, and confirm that wildlife overpasses and underpasses, when combined with some sort of fencing are between 86 and 99% effective at preventing wildlife-vehicle collisions. International best practice examples such as the ‘Zoli Bridge’ are currently replicated in the US. In 2013, a team of Mongolian researchers, transportation officials, and others came to have a look at the 70 wildlife crossings of Western Montana, to implement similar constructions on their new route between China and Russia. The question is, why not Sri Lanka? This is spatially a small island with increasing 20+million residents, and a large diversity of wildlife. There are incidents of humans conflicting with elephants, leopards, and crocodiles. Infrastructure development has never been as extensive as now. It is now that such solutions should be included into projects, to prevent further conflict and loss of life. Again, I suggest consulting the various experts who are very capable of finding localised solutions, based on international best practices. We have the challenge, we have the experts, and I believe we also have the financial ability once the focus is set right.